Judy Foreman’s Memorial Retrospective – R. Blitzer Gallery. In 1916, a group of pacifist and anti-hierarchical Europeans gathered in Zurich, and as a reaction to World War I, generated Dada – an artistic and literary movement that questioned society and challenged the concept of art. To celebrate the centennial of Dadaism, three local galleries have brought together whimsical works from a collection of modern artists, whose paintings, collages, sculptures, and performance pieces invoke the nonsensical essence of Dada. 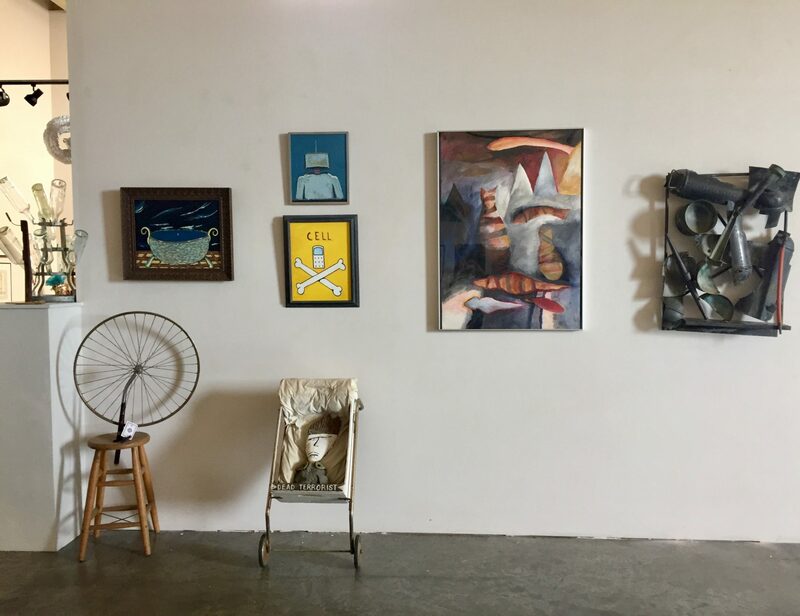 Throughout the month of October, the R. Blitzer Gallery, Felix Kulpa Gallery, and Radius Gallery welcome visitors to observe the absurd in their collaborative Dada-inspired exhibitions and events. Artist and curator Frank Foreman under a self portrait by Judy Foreman. Accompanied by Dada exhibits George Hitchcock at Felix Kulpa, and Simple Life Instructions: D@d@AtTheR@dius, the R. Blitzer Gallery is presenting Judy’s Cabinet of Dada Curiosities and More. The Blitzer exhibition features five decades of artist Judy Foreman’s paintings, drawings, collages, wheely metal sculptures, enamels, graphics, outlaw, and social art. 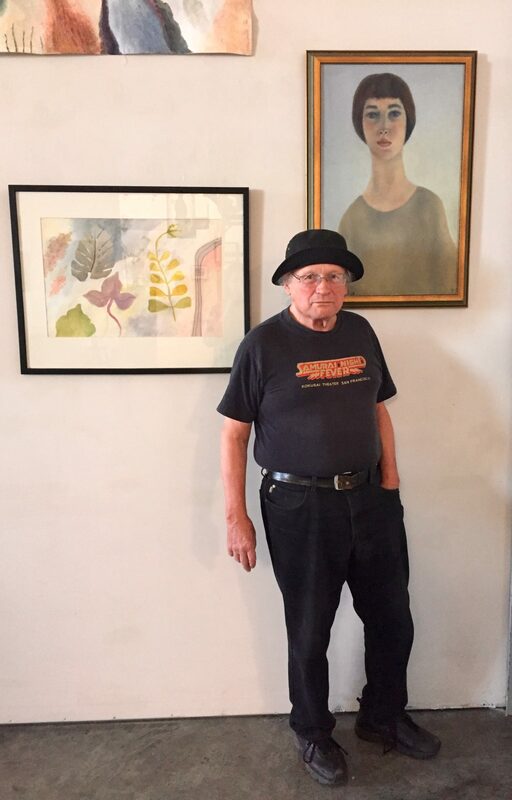 The show has been curated by Judy’s husband Frank Foreman, who is sharing her work as both a public tribute to Dadaism, as well as a personal memorial honoring Judy’s life and her unique creativity. 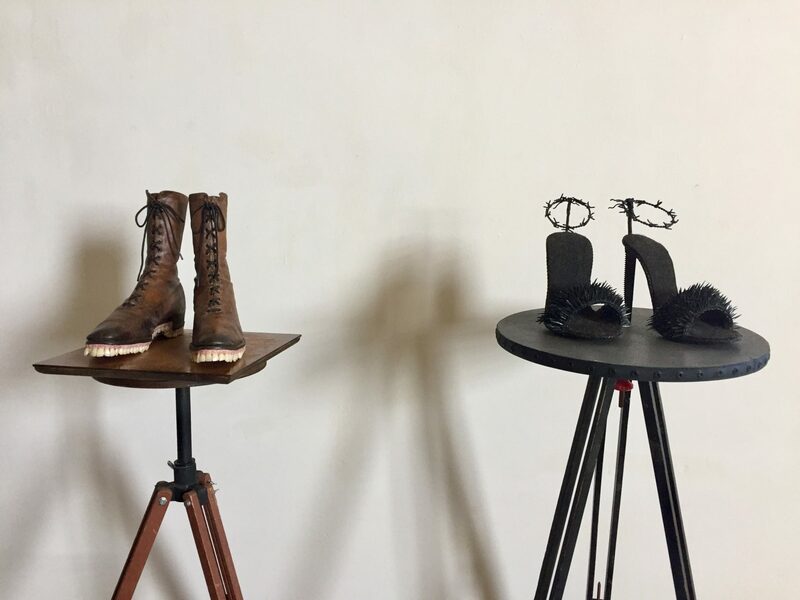 Both Judy and Frank’s idiosyncratic work has been flavoured by many influences, including the Dada movement, medieval beauty, Wabi-Sabi values, traveling, teaching, living in North Beach in the Sixties, and the creative groups they have been involved with. 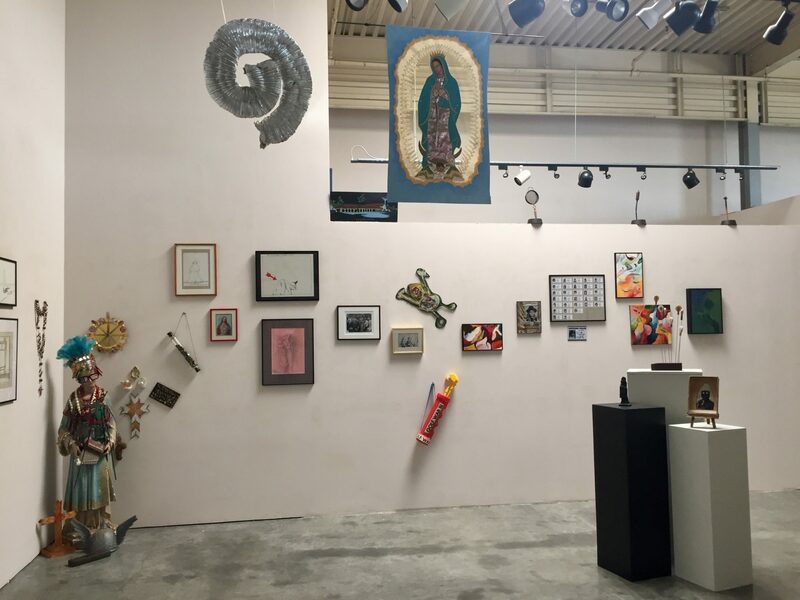 Their eclectic art is displayed alongside a collection of work contributed by Frank, and featuring their many artist friends, students, and mentors. Participating artists include Mel Henderson, Futzie Nutzle, Donald Day, Dennis Hearne, Beili Liu, Anna Martin, Mauro Di Nicci, Leigh Hyams, Victor Schiffrin, Jim MacKenzie Kate Rannells, Tom Maderos, AnaMaria Heigl, and many others from Europe and Northern California. The Blitzer Gallery’s multimedia exhibition draws on the original Dada spirit by being both playful and provocative in nature. Setting the stage for many later avant-garde movements, (including Surrealism, Pop art, and Conceptual art), Dadaists confronted established norms, defied academic traditions, and blurred aesthetic values of fine and applied art by using absurdity to highlight current social issues. Judy, Frank, and the participating artists have captured and challenged modern life by incorporating everyday objects into their work, invoking the element of curiosity in their artistic process, and reinterpreting the imagery and items of popular culture in surprising, humorous, and powerful ways. 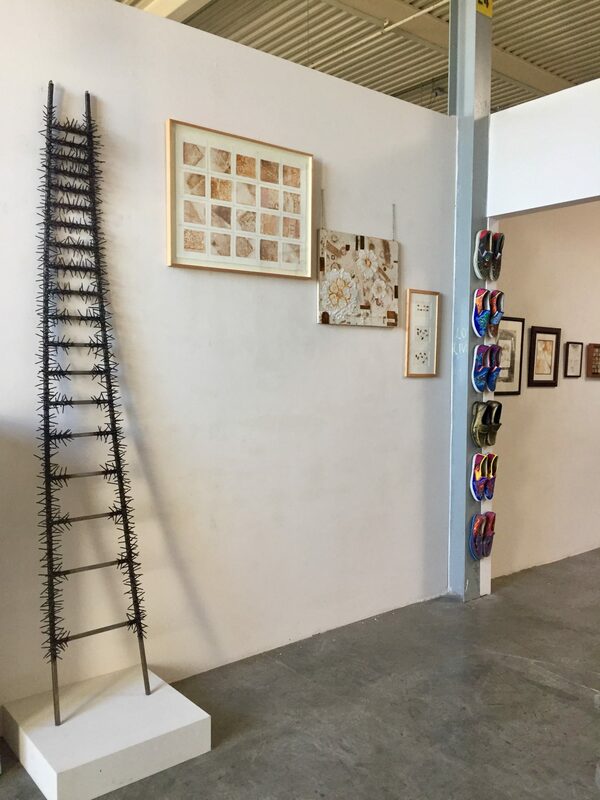 Judy Foreman’s Memorial Retrospective is part of Dada at the Beach – a month long series of unusual Dada events held at the three galleries and around Santa Cruz to further celebrate and revive this artistic, literary, cultural, and social movement. 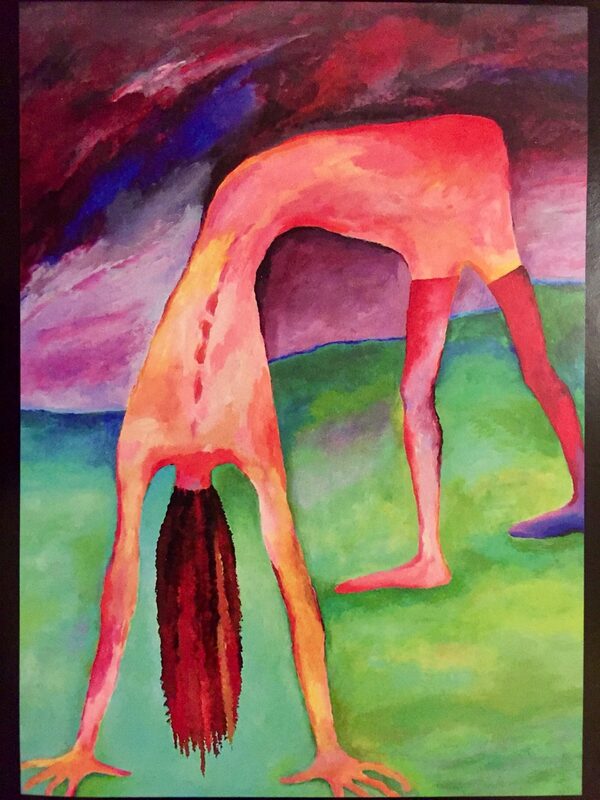 The R. Blitzer Gallery is hosting a music, song, dance, and poetry event on Saturday, October 29th, from 1 – 5pm. The afternoon will feature performances by Mauro Ffortissimo’s open piano, The Saint Cecilia Society for the Preservation and Restoration of Gregorian Chant, Peking Opera and Other Endangered Things of Beauty, excerpts from the Feast of Fools, tap dance, and more. Judy’s Cabinet of Dada Curiosities and More at the R. Blitzer Gallery will be on exhibition October 7 – 30. George Hitchcock at the Felix Kulpa Gallery will be on exhibition October 7 – 30. Simple Life Instructions: Dada@theRadius at the Radius Gallery will be on exhibition October 1 – November 13. Things change. Several friends scheduled to perform on Saturday, Oct. 22 have had to deal with emergencies. Therefore the events scheduled for Saturday afternoon Oct. 22 are canceled and will happen on Saturday, October 29 from 1 to 5 PM. Sorry, but life sometimes gets in the way, as does death. The R.Blitzer Gallery is open Tues. through Sat. from noon to 5 PM.